Muskoka Heritage Place combines the attractions of the Huntsville and Lake of Bays Railway with those of Muskoka Pioneer Village to provide a unique entertainment experience for the whole family. Take a ride on the famous "Portage Flyer" steam train for a pleasant and memorable train ride along one of the most picturesque routes in the Huntsville area. Our beautifully restored vintage open-sided coaches "Algonquin" and "Iroquois" are pulled by our 1926 "0-4-0 ST" steam locomotive, all original Portage Railway equipment. Travel the line along the Muskoka River to Fairy Lake, where you may disembark for a panoramic view of the area! 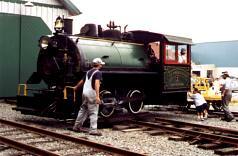 Children are invited into the locomotive cab for a visit with the engineer! Parents, be sure to bring your camera. The station you will visit here is actually the Purser's Cabin from the WaWa Hotel on Lake of Bays, restored in 2004. Next watch as the engine crews turn the engine by hand on the turntable, a now rare sight. Board the train again for an enjoyable ride back to the Rotary Village Station. Visit the Rotary Village houses a museum featuring exhibits from the steamship era, and of the original Portage Railway that connected them. An eight minute video features rare colour footage of the local steamships and the Portage Flyer. The museum also features a working telegraph office that operates Wednesdays during July and August. Send a telegram to yourself. On special days, volunteer telegraph operators travel from great distances to give a rare demonstration of a telegraph in operation. Write a telegram and see it actually being transmitted by Morse code. On your arrival at the next station, pick up your souvenir telegram in a special commemorative envelope. They make a great souvenir or gift. Take a leisurely stroll back in time through the heritage buildings of Muskoka Pioneer Village; enjoy the sights and sounds of days gone by; chat with costumed interpreters; visit a sawmill, a church, a blacksmith shop, a trapper's cabin, pioneer homes, a school, a general store, an inn, gardens, and farm animals.